Painting the roof is a satisfying but challenging work. A properly-done roof paint job could add wonders not only to the physical appeal of your house but also to prolonging its life. 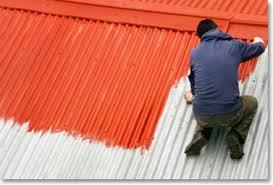 Before undertaking a roof painting project, observe all safety precautions to avoid injuries. Safety is the number one priority when you want to work on the roof. Some people, however, make the mistake of skipping safety preparations because they take time. Falls are common occurrence in roof repair work. Professional Roofing magazine reports that six deaths from falls are recorded each month in the US. Never use a damaged ladder or a makeshift one and be sure to always inspect the ladder before using it. Ladders should also conform to safety quality standards. To secure the ladder, tie the top to a stable part of the roof. Extend your ladder by about three feet above the roof or eave to serve as your handhold when going down the roof. Place the ladder on a stable portion of the ground, preferably on a solid, even and dry ground. Put it against the wall at the correct angle. Never slide down the ladder but step one rung at a time. Face the ladder when climbing up or down. Do not leave ladders at the work area after your work is done for the day. Remove it and put it back the next day. Work with a companion whenever possible. If an accident occurs, one of you could immediately call for medical assistance. Use protective equipment such as mask, helmet, gloves and goggles. Wear shoes suitable for climbing ladders and roofs, preferably a pair with good traction to prevent slipping. Soft-soled boots are the best. Wear protective glasses to avoid spraying your eyes with paints and chemicals. Before using any power tools such as spray painter and sanders, be sure to read the instructions first and familiarize yourself with their operations. Never work when the roof is wet because the risk of an accident is greater. Moreover, paint will not properly stick to a wet roof. Always work under good weather condition. To avoid being possibly knocked off the roof, never work when the wind is strong. When painting on steep angles, employ safety equipment such as guardrails, net and safety harness. Clean and organized the work area. Identify danger areas such as weak roof sections and proximity to power lines. Remove clusters, debris, unnecessary tools and other obstructions before starting the roof paint job.